Young Scholars with Voices (YSWV) is a non-profit organization founded in 2012 to prevent and raise the awareness of bullying amongst adolescent youth. YSWV provides services to victims, survivors and individuals affected incidents of bullying. YSWV is a community based organization offering support and meeting the needs of its addressed target population. YSWV offers one-on-one peer mentoring, prevention/awareness workshops and clubs and will hold poetry showcases in which the members of YSWV share their talents through poetry and spoken word to raise the awareness of bullying. The organization is needed in communities because there is a lack of awareness and knowledge of the incidents of bullying. Young Scholars with Voices will support victims, survivors and individuals of bullying, but also educate the bystanders and those who are unaware of the scope, causal factors of bullying and solutions to prevent and raise the awareness of bullying. The following arguments will document that bullying exist and is a problem and further provide explanation to why the YSWV program is needed. Bullying is becoming more widespread and relevant, effecting society today. There is an increase in the incidents of bullying amongst adolescents living in urban communities. Bullying is defined as an unwanted behavior that involves an imbalance of power (U.S. Department of Health and Human Services, 2001). When bullying is thought of, it is thought to be an aggressive behavior against a weaker individual and according to the many definitions this it true. However, physical bullying is not the only type of bullying that exists. Different types of bullying include: physical and hazing, cyber and verbal and indirect and social alienation (Stop Bullying, Harassment and Violence, 2009). In the article “How Our Society has manifested the bullying Epidemic?” researcher Amy Weber argues that bullying is a multi-layered epidemic. She argues that bullying is like a disease that cultivates and feeds of off the bloodline of social acceptance, fueled by fear and pain so deep, it is subconscious (Weber, 2012). Furthermore, Weber states that the behavior is learned and it manifests form single or multiple sources where a child is listening and watching; children mirror back what they see, revealing the ugly truth of society’s relentless intolerance and cruelty towards each other over the decades (Weber, 2012). In an article done in 2011 by the American College of Pediatricians bullying is typically directed at unique characteristics whether real or perceived by others of an individual such as: ethnicity or race, physical build or features of appearance that are unique and different, social or economic status, physical inabilities and disabilities, mental of scholastic abilities, speech quality or tone, sexual orientation or sexual activity and moral or religious beliefs (American College of Pediatricians, 2011). National statistics show that 28% of U.S. students in grades 6-12 have experienced bullying and 20% of U.S. students in grade 9-12 have experienced bullying. Furthermore, approximately 30% of young people admit to bullying others, 70.6% of young people have witnessed bullying in their schools and 70.4% of school staff has witnessed bullying. The following percentages show the various types of bullying experienced amongst U.S. middle school students: name calling (44.2%); teasing (43.3%); spreading rumors/lies (36.3%); pushing/shoving (32,4%); hitting, slapping or kicking (29.2%) and only about 20 to 30% of U.S. students who are bullied notify adults about bullying (U.S. Department of Health & Human Services, 2012). Working directly with the target population bullying is witnessed and the causal factors vary for each individual. Some the causal factors include physical appearance, the target population bullies one another based on what is seen on the outside. Thing such as clothing, skin tone, weight, height, and even speech difficulties are reported causes for bullying by the target population. Additionally school is another cause, such as the lack of athletic ability, popularity and scholastic ability. Based on the target population survey “How does bullying affect you?” conducted for Lincoln University of PA’s Masters of Human Services Program showed that 30% of the respondents surveyed believed that appearing to be different from others was the cause for bullying, only 20% of the respondents believe that bullying was caused by scholastic achievement and 50% of the respondents believed that bullying was caused by the victims appearing to be weaker. Furthermore, 60% f the respondents surveyed said they would participate in the act of bullying if it protected them from becoming a victim of bullying and only 40% of the respondents reported they would not participate in the act of bullying even if it did protect them from becoming a victim of bullying. Additionally previous pre/post test and participant satisfaction survey results have shown that YSWV is an effective program and has helped to raise the awareness of bullying and also offer solutions for bully prevention. Pre/post test scores have shown a 95% increase in participant knowledge of the topic being addressed. Furthermore, the participant satisfaction survey showed that the members of YSWV were not only satisfied with the services received but also expressed hopes of the program continuing. The following statements will explain the goals and objectives of YSWV that are expected to be accomplished and also discuss the S.M.A.R.T. objectives that have been formulated for YSWV. The ultimate goal of YSWV is to prevent and raise the awareness of bullying. YSWV is a system with several sub system components, the sub systems will work as objectives to meet the ultimate goal of preventing and raising the awareness of bullying. Furthermore, each sub system has its own goal and objectives. YSWV offers a one-on-one bully mentoring program and the goal of this component is to foster a confiding friendship, self-acceptance, understanding and confidence. Victims of bullying isolate themselves from socialization and do not have trusting individuals who they can come to about their experiences of bullying. Additionally, bullying causes victims to lack confidence and acceptance of themselves. The objective to meet the goal of the peer mentoring component is for all members to be matched with a trusting individual who will build self-acceptance, understanding and confidence through mentoring. Another sub system of YSWV is the workshops. The workshops will be for educational purposes only and the goal of every workshop is to raise the awareness of bullying by increasing the participants knowledge about the incidents of bullying. The objective to meet the goal of the workshop component is to construct fun learning by bring clear, concise and retainable information to the participants. YSWV also offers a speaking out club, which is a spoken word/poetry club. The goal of the poetry club is for the members to share their voice on the issue of bullying in spoken word or poetry form. The objective to meet the goal of the speaking out club is for members to use the knowledge gained from the workshops, their personal thoughts, feelings and experiences and write poems that will help to prevent and raise the awareness of bullying. The last component of YSWV is the poetry showcases. The goal of the poetry showcases is to bring the community together, prevent and raise the awareness of bullying. The objective to meet the goal of the poetry showcases is for the members to advocate positivity, members will use their poetry pieces as a tool for preventing and raising the awareness of bullying and the showcase will be used as a tool to bring the community together. The S.M.A.R.T. objective developed for YYWV states, “In time for the annual quarter ceremony all members of YSWV will increase their knowledge about bullying by 90% from the utilization of peer mentoring, educational workshops and poetry clubs by showcasing their talents in a poetry showcase to prevent and raise the awareness of bullying”. The following session will explain the theory behind the logical model and the rational for the use of the model. The logical model is a planning tool used to clarify and graphically display what your project intends to do and what it hopes to accomplish and impact. A logical model summarizes key program elements, explains the rational behind the program activities, clarifies intended outcomes and provides a communication tool (National Network of Libraries of Medicine, 2012). 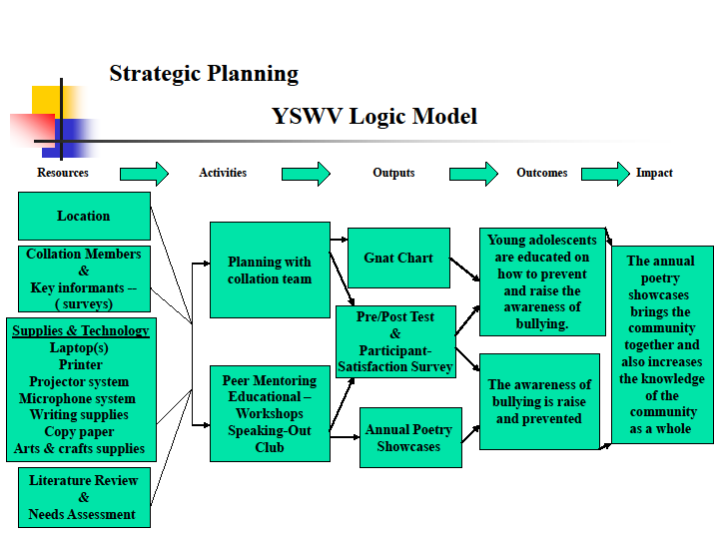 The purpose of using a logical model for YSWV is to illustrate the sequence of events that identity the programs resources, match resources to needs, activate the service process, complete the service process and measure the program results which is displayed in the model below. This model allows the planner to see the rational flow of addressing the problem and applying process, while maintaining a focus on the purpose of the entire effort: preventing and raising the awareness of bullying. The following section will discuss and explain the budget summary for YSWV, including all expenses and possible in-kind contributions. The personnel costs include the cost of four group facilitators (three hours, once a week for ten weeks) who are employees of the agency and four additional consultants (four days an hour per consultant). Additionally, the program will require ten peer volunteers (three hours, once a week for ten weeks) and a DJ (1.5 hours) for the YSWV annual poetry showcase. The personnel cost will be absorbed by the agency as the project will happen on agency time and the consultants will donate their services in-kind. Office supplies will include copy paper for the photo copying of flyers for promotion of the poetry showcase. Each participant will receive writing supplies; this will include one, one-subject note book, four pens and four mechanical pencils. The art supplies will include crayons, markers, color pencils and construction paper that will be used by the members to design and create additional flyers for promotion of the poetry showcase. The office, writing and art supplies estimated cost will be in-kind donations from local businesses. The programs workshops will require one LCD project four laptops will be required for each group to allow the members of YSWV to complete research for the project during meeting times and an all-in-one printer. The technology equipment will be barrowed in-kind donations from the agency as the project will happen on agency time. The program will require the use the facilities classrooms (four) for the group sessions and auditorium for the poetry showcase. The cost is base agency’s normal rental rate. The consultants will use their own personal vehicle to travel to the program for the workshops. The estimated cost is based on the mileage reimbursement rate used by the agency; the consultants will be given a maximum of 15 miles at $0.50 per mile. The printing and photocopying estimated cost will be donated in-kind by local businesses. Decoration and refreshments for the poetry will be in-kind donations from local businesses. Refreshments for each session will be provided by the agency, the estimated cost is $25.00 per session. The total expenses associated with implementing this project is $9,192.50. The following section will explain the project activities and the timing of the activities being implemented for YSWV. The charts being used in this section will be a Work Plan and Ganntt Chart. The following section will explain the methods that will be used in the evaluation of the proposed program YSWV and the difference and purpose of qualitative data and quantitative data. There are several types of evaluation designs. These designs include experimental, quasi-experimental and non-experimental. The non-experimental design will be used in the evaluation of the bully prevention and awareness program, YSWV (Young Scholars With Voices).Non-experimental designs do not involve random assignment of subjects to groups, nor is there a control or comparison group. Non-experimental designs do not have comparison groups. They are used to assess the programs impact. Non-experimental designs can be used for process evaluations when the primary purpose is to describe participants’ experiences (Kantor and Kendall-Tackett, 2000). The types of non-experimental designs used in the evaluation of YSWV were pre/post tests and participant satisfaction surveys. The pre/post test will measure the knowledge of the participants. The pre test measures the knowledge before the participation in YSWV. The post test measures the knowledge gained after participating in YSWV. In the end the results of each test is compared to see if the participates knowledge increased and the program was effective. The participant satisfaction surveys will measure the levels of satisfactory delivered to the members of YSWV.The pre/post test is a summative evaluation method. The focus of summative evaluation is the outcome. Outcome evaluation relates to the effect of intervention and whether the project achieved its goals. Outcome evaluations assess the effectiveness of a program in producing change. Outcome evaluations focus on difficult questions that ask what happened to program participants and how much of a difference the program made for them (Linnell, 2012). The participant satisfaction survey is a formative evaluation method. Formative evaluation is a method for judging the worth of a program while the program activities are forming and summative evaluation is a method of judging the worth of a program at the end of the program activities (Clark, 2010). Formative evaluation focuses on process. Process evaluation measure relates to methods or activities and explains how and why the results were achieved. Process evaluations document the process of a program’s implementation. The focus of a process evaluation is on the types and quantities of services delivered, the beneficiaries of those services, the resources used to deliver the services, the practical problems encountered, and the ways such problems were resolved (Linnell, 2012). Qualitative data gathers information that is not in numerical form. For example, diary accounts, open-ended questionnaires, unstructured interviews and unstructured observations (Mcleod, 2008). Qualitative data is useful for studies at the individual level and to find out in depth the way people think or feel. Analysis of qualitative data is difficult and requires accurate description of participant responses for example, sorting responses to open questions and interviews into broad themes. Qualitative data is typically descriptive data is harder to analyze than quantitative data. Quantitative data gathers information in numerical form which can be put into categories, or in rank order, or measured in units of measurement. This type of data can be used to construct graphs and tables of raw data (Mcleod, 2008). For example, a rating scale or closed questions on a questionnaire would generate quantitative data as these produce either numerical data or data that can be put into categories. Kantor, K.G. and Kendall-Tackett, K. (2000). “A guide family intervention and prevention program evaluation”. Clark, D. (2010). Formative and summative evaluations in the instructional design process. The following test will be used as a data collection instrument to evaluate the knowledge gained from the bully prevention and awareness program YSWV (Young Scholars With Voices). The test will be given in a two part series. The Pre-Test is series one and will test the participant’s knowledge on bully prevention and awareness. The Pre-Test will be given during the first two weeks of programming. The Post-Test is series two and will test the participant’s knowledge gained from YSWV. Both tests will consist of the same questions and there is no right or wrong answer. The information collected from the test will be used as a form of research to construct a final project and presentation for Lincoln University’s Master of Human Service academic program. The test is anonymous and will not effect or penalize any youth participating in YSWV, so I ask that you answer each question honestly to the best of your ability. –Thank you for you participation in YSWV and also for you time. In your own words, please define bullying? In your own words, what do you think causes bullying? In your own words, what do you think will prevent bullying? How can being a member of YSWV raise the awareness of bullying? "Program for Bullying Awareness." UKEssays.com. 11 2018. All Answers Ltd. 04 2019 <https://www.ukessays.com/essays/social-policy/program-bullying-awareness-8001.php?vref=1>. "Program for Bullying Awareness." All Answers Ltd. ukessays.com, November 2018. Web. 23 April 2019. <https://www.ukessays.com/essays/social-policy/program-bullying-awareness-8001.php?vref=1>. UKEssays. November 2018. Program for Bullying Awareness. [online]. Available from: https://www.ukessays.com/essays/social-policy/program-bullying-awareness-8001.php?vref=1 [Accessed 23 April 2019]. UKEssays. Program for Bullying Awareness [Internet]. November 2018. [Accessed 23 April 2019]; Available from: https://www.ukessays.com/essays/social-policy/program-bullying-awareness-8001.php?vref=1.